AutoCard Solutions can just about integrate any point of sale system on the market today. Please contact us if you have question regaurding your point of sale systmem. You’ve worked hard to get your business going. Isn’t it time you gave it – and yourself – an advantage? Now you can, with Clover Station. Software updates are automatically delivered to your device, so you’ll always have the latest version. Its cloud-based software enables you to manage your inventory, track revenues, and generate reports. Run reports that distill your transaction data into powerful intelligence, and use insights to make better decisions. Safeguard your customers card data with the latest in security technology. Want to know more about Clover Station? Ask our Clover Support Team and receive a call or email within twenty-four hours. You will be contacted within twenty-fours hours. AutoCard Solutions featuring Clover Mobile include powerful cutting edge hardware and software, the most advanced payments security technology around and more. Every business is unique, Clover is designed them with flexibility in mind, so you can pick the combination that’s right for you. Clover Mobile offers a wide range of tools that help you manage your business more efficiently. Track inventory, manage staff, discover customer insights, seamlessly integrate to Quickbooks, build loyalty programs, and do much more with easy access to a dedicated app market. Clover Mobile includes a built-in trigger barcode scanner and camera to give you even more convenience and control on the go. You will be contacted within twenty-four hours. Designed with your convenience in mind, solutions featuring Clover Mini bring together cutting edge hardware, state of the art security, beautiful design and more, so you can spend more time doing what you love and less time looking for the right tools to run your business. With Clover Mini, you can securely take all types of payments, including EMV and Contactless, and download a variety of apps to help you run your business more efficiently. Get Clover Mini and get more time to do what you love. With Clover Mini, you can securely take all types of payments, including EMV and Contactless. Download a variety of apps to help you run your business more efficiently. Get Clover Mini and get more time to do what you love. Peace of mind with multiple levels of security for your data. Simplifies and streamlines many of your business operations. EMV-enabled so you won’t be held liable for fraud. Versatile, full-featured mobile device with extensive payment acceptance capabilities on-the-go or at your place of business. With a built-in scanner, camera, and printer, Clover Flex can help you process orders and payments more quickly. Device lasts up to 8 hours on a single charge. From managing employees and inventory to serving customers and promoting your business, you’ve got a lot going on. Clover® Station lightens that load. It’s the complete business management system that will have you up, running and improving your business in no time. Take virtually all kinds of payments, from magnetic stripe, EMV® chip, standard credit and debit cards to contactless payments, straight out of the box. Help keep your and your customers’ information safe with built-in fraud protection from Clover Security. Set up a digital loyalty and rewards program to drum up new business and keep existing customers coming back. Clover enables small businesses to accept both In-Person and In-App payments for Apple Pay. In-Person payments let customers simply tap their iPhone to pay at the point-of-sale. All Clover devices can accept In-Person payments. The Clover Station requires the optional FD-40 PIN pad accessory to do so whereas Clover Mobile and Clover Mini have contactless payment acceptance built right in. Customers simply tap their smart phones near the device to pay with the credit card they registered with Apple Pay. Clover Mobile, Clover Mini, and the FD-40 are all fully EMV compliant for both chip cards and contactless cards, which helps you prepare for the October 2015 liability shift that incentivizes merchants to accept EMV chip cards. In-App payments will transform how your customers interact and transact with your business. In-App payments will transform how customers can interact and transact with your restaurant or retail shop. Consumers will be able to order and pay at the table, order ahead, and self-checkout. We're obsessive about your security, and that of your customer. End-to-end encrypting card reader, data tokenization, locked-down operating system, and mutually authenticated SSL are just a few of the technologies we've built into Clover. With all the security concerns around, you need to ensure that your POS system adheres to the latest security standards. The Clover Station is fully PCI compliant, so you don't have to worry about fines for noncompliance. Letting your customers sign for their purchase on the screen = cool. Giving them unintentional access to all your other sales, customer, and employee data = not so cool. Clover's proprietary pivot arm lets you rotate seamlessly to what we call the “customer-facing view” when presenting the display for signature. This restricts what the customer can see and access, keeping all your sensitive data safe. Our security measures and methods are continuously being updated in order to best deal with potential risks. Report potential security issues for your Clover device at security@clover.com. Help us provide the most secure point of sale software in its class. Clover put extra measures in place to make sure your Clover Station stays up and running and that there's always someone to call if you need to. Even if that's 11:35pm on a Friday night. Don't let a spotty Internet connection stop you from taking payments. Clover Station will continue to accept payments even if the Internet is down. We have Ethernet, Wi-Fi, and 3G connection options so you can choose the best way for your business to stay online. Your business doesn't run 9 to 5, and neither do we. Phone or email - however you like to get help, we're available anytime. If you lose your device (or, um, accidentally drown it in coffee), you don't lose your data. We store it securely on our servers so you can always access it from your device or from your computer. Look closer at the Clover Station and you'll see that the details make a difference. 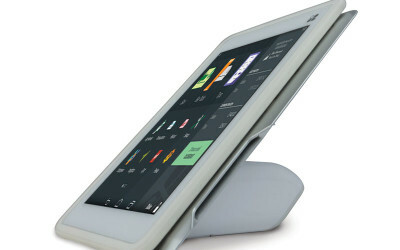 The large touchscreen display translates into faster transactions. The long card swipe is designed for speed and accuracy. Four USB ports hidden underneath the printer connect multiple peripherals at once, simply and securely. You shouldn't have to compromise between aesthetics and performance. With Clover, you don't have to. Through a combination of speed and smarts, ShopKeep point of sale takes all the sting out of retail. Receive promotions: Discounts, Rates, Specials, and more! Autocard Solutions is a registered ISO of Wells Fargo Bank, N.A., Concord, CA.